The number of breweries in Virginia has more than doubled in the last five years; there are now more than 100. West Coast brewing heavyweights like Stone Brewing Co. and Green Flash Brewing Co. are taking advantage of the Old Dominion state’s auspicious East Coast location and appetite for local beer. Charlottesville and nearby Nelson County have become a paradise for outdoor enthusiasts who are also beer lovers. 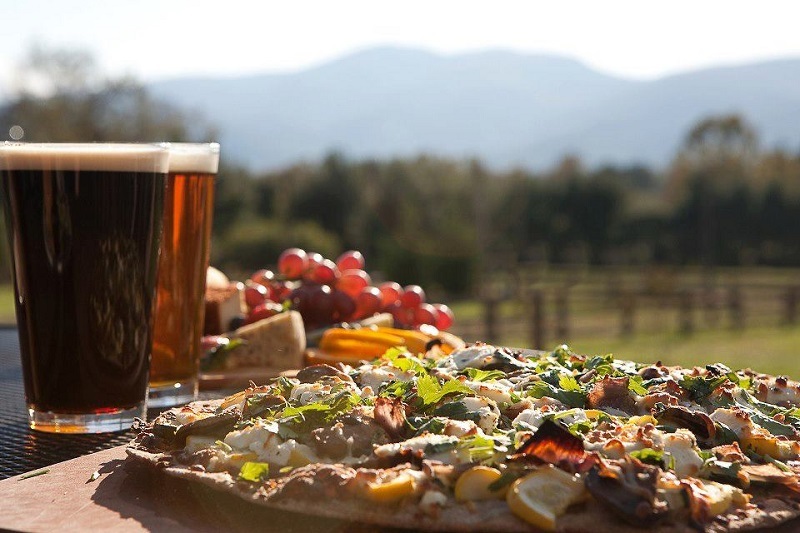 The area boasts a bounty of bodacious breweries set amid the majestic Blue Ridge Mountains. Head to Three Notch’d Brewing Co. (946 Grady Ave., Charlottesville) for happy hour. Get a flight so that you can sample six stellar beers at once. The brewery does Belgian-style beers particularly well. Eat dinner at Maya (633 W. Main St.), a hip Midtown restaurant with a great patio that serves nouveau Southern cuisine. Try the scrumptious pimento cheese fritters with pepper jelly to start. You can’t go wrong with Maya’s baby back ribs paired with macaroni and cheese and the most delectable collard greens in town. Maya has a fine selection of local beers as well as an outstanding cocktail menu. South Street Brewery is Charlottesville’s longest-running brewery. 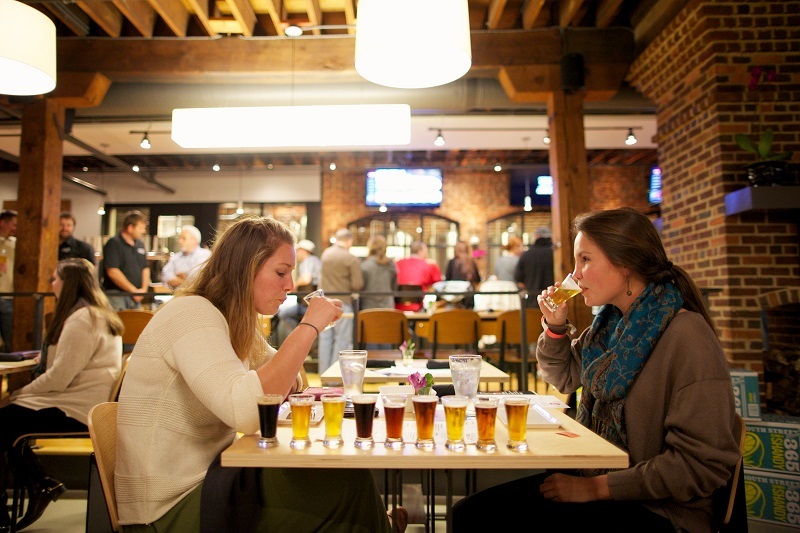 Grab an after-dinner drink at South Street Brewery (106 South St. West), Charlottesville’s longest-running brewery. Blue Mountain Brewery took over ownership of South Street in 2014, but the brewpub has maintained some of its original mainstays, like the J.P. Ale, a solid American pale ale made with Centennial and Cascade hops. Work off the calories with a stroll along the historic downtown mall. It’s an incredible place to people watch. Charlottesville boasts one of the longest pedestrian malls in the country. It’s dotted with impressive oak trees and lined with unique shops, bars and eateries. In a year’s time, Champion Brewing Co. made the leap from neighborhood taproom to production brewery. Head to Champion Brewing Co. (324 6th St. SE) for a nightcap. 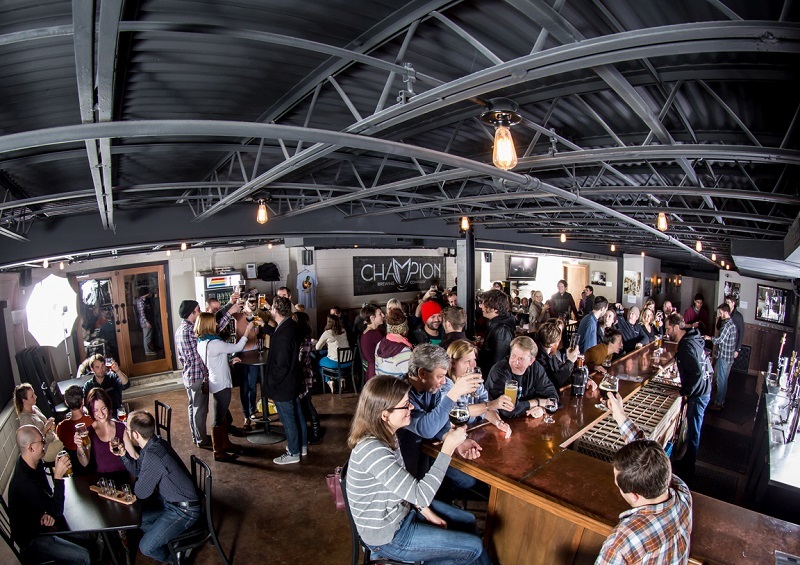 Champion opened its doors in late 2012 and was one of the first C-Ville taprooms to take advantage of a state law allowing breweries without restaurants to sell beer on-site. The explosive growth took Champion from a neighborhood taproom to a production brewery in just a year’s time. In the mood for something refreshing and different? Try the Face Eater Gose made with Himalayan pink sea salt. Have breakfast at Beer Run (156 Carlton Road). Try the El Mariachi tacos—featuring egg, cheese, house-smoked pork and pickled onion served on corn tortillas. Get a side of Texas frites with paprika mayo. The Bloody Mary has won local accolades, and Beer Run has a fine draft beer list. Head to Monticello (931 Thomas Jefferson Parkway; $20-25 entrance fee) the extraordinary home of our third president. Thomas Jefferson’s wife, Martha, was a skilled brewer who brewed small beer (a low-alcohol variety) with a fair amount of hops for flavoring, which was unusual at the time. Beer was the table drink served to guests at Monticello. After Martha’s death, Thomas dabbled in homebrewing. You can visit the historic beer cellar and learn more on the Monticello house tour. Afterward, take Interstate 64 west out of town and then head south on Route 151. It’s a picturesque drive with rolling hills and impressive old “farm” estates. Stop to check out some of the awe-inspiring Blue Ridge Mountain vistas on the way. By this time, you’ll have worked up a thirst. You can quench it with Bold Rock Hard Cider (1020 Rockfish Valley Highway, Nellysford). The cidery is just a bit farther south on 151. Bold Rock was born of a partnership between a native Virginian and a New Zealand cider master. The cider is top-notch and Bold Rock’s growth since opening in 2012 has been exponential. Bold Rock offers tours, free tastings and flights for purchase in its gorgeous red Cider Barn, which has a window into the production facility and a deck overlooking the mountains. Hungry? You don’t have to travel far for lunch. Devils Backbone Brewery (200 Mosbys Run, Roseland) is just a mile or so down the road. Like Bold Rock, the Devils Backbone Basecamp occupies an impressive swath of stunning land amid the mountains. The handsome building housing the brewpub is reminiscent of a hunting lodge you’d find in Montana. Try the award-winning Vienna Lager with pork belly sliders and bacon jam. Stop to check in at Wintergreen Resort (39 Mountain Inn Loop, Roseland; starts around $175/night). Take a hike at Wintergreen, which is located in a section of the Blue Ridge called “Old Appalachia” and features Eastern hardwood forests, or take advantage of other activities, like the spa, skiing, golf or tennis. Alternatively, for a quiet stay in a historic house, go to the Afton Mountain Bed and Breakfast (10273 Rockfish Valley Highway in Afton; starting at $139 a night). The 10 acres surrounding Wild Wolf Brewing includes a biergarten. Eat dinner at Wild Wolf Brewing (2461 Rockfish Valley Highway, Nellysford). The “farm-to-fork” restaurant and brewery is located in a renovated schoolhouse. The surrounding 10-acre property has a lovely biergarten. Try the shrimp and grits or a dish that features the beer-brined, house-smoked meats. Get a sampler of the house beers or pick from several seasonals that are more experimental. Indulge in a beer-battered fried Oreo for dessert. Stick around for live music. Have brunch at Blue Mountain Brewery (9519 Critzers Shop Road, Afton). Blue Mountain is yet another brewery set in an idyllic location, but it was a trendsetter, opening in 2007. Blue Mountain has an awesome patio and neighboring hop farm. If available, try the Mandolin Belgian Tripel and Dark Hollow Imperial Stout; both outstanding. Order the local sausage gravy with buttermilk biscuits or opt for one of the fabulous thin-crust pizzas. Blue Mountain has lawn games and features live music on Sunday afternoons. The patio at Blue Mountain Brewery offers an excellent view of the Blue Ridge mountains. Alternatively, go to the Blue Mountain Barrel House (495 Cooperative Way, Arrington). It’s a longer drive, but it’s a more intimate setting that has food trucks and highlights Blue Mountain’s barrel-aged brews. A visit to the Blue Ridge Mountains is not complete without a visit to Shenandoah National Park. Take Highway 250 West to Rockfish Gap, the southernmost park entrance ($15 fee). Drive about 10 miles and park at the Jarman Gap parking lot. From here, you can cross the road to access a trail to climb Turk Mountain. It’s a moderately difficult 2-mile hike, and you’re rewarded with a spectacular panoramic view at the top. Get back on Interstate 64 and head east to finish your weekend at the Starr Hill Brewery taproom (5391 Three Notched Road, Crozet). Founded in 1999 by brewer Mark Thompson with backing from Coran Capshaw (real estate tycoon and manager of the Dave Matthews Band), Starr Hill is now the largest brewery in Virginia. Its regular cast of beers is solid, but the recent seasonal experimentations are the ones people are talking about. The spring release, Reviver Red IPA, is a highly regarded IPA-amber hybrid made with a combination of seven hop varieties. Thanks for the great ideas. Hmmm. Now how to get the wife interested – to her it’s about more that the beer.